I have some exciting news to share. This week marks the debut of a book called Vampire Knits, and I just happen to have a sweater in it. Actually…I happen to have the COVER!! My contribution, the Lore Hoodie was a last minute one, and it had to be knit twice because the first one got lost in the mail (d’oh!). I was actually pleased to get the chance to reknit it because I made a few improvements to the closures, switching from buttons and snaps to toggles with slightly felted crochet loops. Genevieve Miller, the editor of the gorgeous book gave a great interview at Comic Con that you can watch here. She’s also blogging about the book here. She graciously accepted my very last minute proposal, which was inspired by the long winter walks I was talking in between devouring Twilight and episodes of Buffy the Vampire Slayer. The hoodie is knit in wonderfully light Peruvia Quick in a color that I have personally banned myself from using for awhile. Almost every Berroco yarn comes in this elusive purply-brown shade and I find it irresistible!! It goes with everything and it warm, unique and flattering. I highly recommend it…if I can’t knit or design with it, YOU should! P.S. The winner of the Remix/Acer cardigan kit is Seanna Lea! Congrats Seanna, and thanks to everyone who entered! I have to admit that I really dislike Twilight, but I love Buffy. This shade is one of my favorites in the Berocco line along with a wonderful vibrant teal that you also have. Yummy! I have more of this color (in Berroco Alpaca) in my stash than any sane person would. It and the pea green Alpaca are so fun together! Beautiful sweater….toggles and frogs are a great idea. I love it….stunning on this model too! Isn’t she beautiful?? I love red hair!! I LOVE your Lore Hoodie! I recently ordered a bunch of Peruvia Quick in Bing Cherry and just decided I want to knitt Lore with it. So, while ordering Vampire Knits, I also ordered Norah’s, Knitting with Nature. 🙂 Thank you, thank you! I hear you on the purples, they are just so perfect, it’s hard to resist! 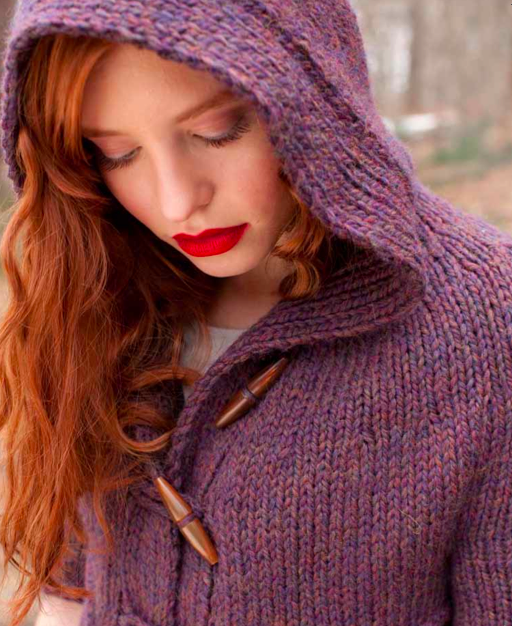 The hoodie is beautiful – I love chunky yarn in lace patterns – and it’s perfectly vampire-y but not too much. My daughter has been eyeing it…. that looks wonderful! And i love the color too, congrats to you!! Living less than an hour from the heart of Twilight-land it is a bit hard not to get a little caught up in the hoopla! Of course i have always enjoyed reading such type stories. Congratulations! It’s (another) beautiful design. BTW, you are remarkably calm about the first getting lost in the mail. This is so beautiful! Good call on the toggles. You can always spot a vampire by how he manipulates your toggles with chilling speed and precision. i love the switch to toggles. very stabby stakey! Love Lore and that color! What a great attitude about it getting lost… that’s my worst nightmare, besides, of course, getting bitten by a vampire! Have you considered selling the pattern on Ravelry?? Thanks, Denise! This pattern is only available in the Vampire Knits book at this time. It’s a great collection! Vampires scare me but I love your sweater. I don’t like purple very much but I love purple-brown. I don’t know if you can answer this but just thought I’d ask anyway: what is the the pattern that’s featured up in the logo on this blog right now? It has the green yarn and the tulip looking stitch pattern. Thanks. I’m not really a purple person either, but this color is just gorgeous practically a neutral in my opinion. The pattern in the header is Loope from last fall’s Lustra book. I’ll look that pattern up. Thanks. Berroco has nice purples. It’s weird about neutrals. Last year I wore a bright mustard yellow scarf almost every day. Not only could I not believe how good it looked on me but it went with almost everything I own. The model is my daughter. I can’t believe how beautiful she looks. It was a fun shoot. How cool!! She is indeed SO gorgeous, and she did a wonderful job in the whole book! The knitters are loving her look. I always try to hire red-headed models, and they often come to set with blonde hair instead–it’s a bummer! Beautiful color, beautiful sweater & a beautiful girl. So pretty! Is the color Boysenberry, by chance? I hope so….I just ordered 13 hanks to knit my hubbie Pacey for Christmas. Of course, there’s no way it will be a surprise for him. Wow, this is really weird. I just cast(ed?) on this pattern this afternoon. I bought the VK book at Borders during the big closing sale and was super excited to find it. Anyhoo, I was looking for a link to the pattern online to show a friend what I am working on, and how weird that I cast this on exactly one year after this was posted? It was meant to be! I can’t wait to finish it, it is a great pattern!!! Next article Remix makes the Cover of Knitty!